When you implement Dynamics AX the last thing that you want to do is keep the old system around just so that you can access the historical information. One example of this is the sales history which is useful for reporting and trending, and also important when a customer calls up and asks about an order from a year ago. You may think that it is too much work to move all of that information over to your new system, but it’s not so. Using the Data Import Export Framework you can bring all of your historical sales orders over and be able to access them from within Dynamics AX. You’re one step closer to cutting the cord on your old ERP system. The Data Import Export Framework within Dynamics AX is great, but not completely infallible. When you import Released Products, you may find that the Default Order Settings are blank and there is no way to define a default site for Sales, Purchasing or Inventory. Don’t fret though there is a quick way that you can reconnect the wires through the Excel Add-In so that you can start getting back to work. Let’s start off with saying that Lync is great, and the integration that is built into Dynamics AX that allows you to IM and call other employees directly from their name rocks. If you have it connected through your phone system then it becomes awesome because you can make calls to other phones. The only thing that would make it perfect would be if you could click on a customer’s contact phone number within Dynamics AX and have it call the number without you even lifting a finger to press the digits. Luckily with a wee bit of code we can set this up. Dynamics 101 just released out their list of Top 25 Dynamics AX Blogs and DynamicsAXTipOfTheDay.com made the list along with 24 other excellent blogs as well. 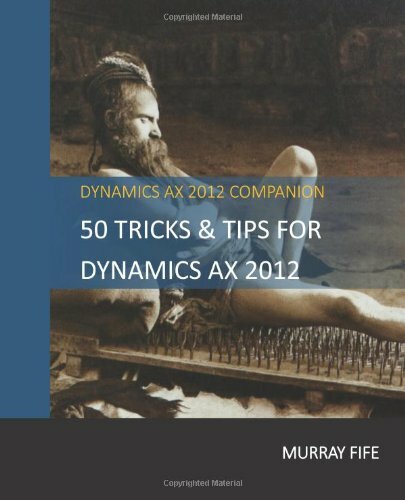 About a month ago I reached a milestone on my Dynamics AX Tip Of the Day blog site (www.dynamicsaxtipoftheday.com) and realized that I had compiled another 50 tips that I can share with everyone as a 3rd tip compendium. Over the past couple of weeks I have managed to sit down and organize them and am happy to say that this weekend I finished the job, and now the 3rd volume within the Dynamics AX Tips & Tricks series is now available on Amazon. I was a little worried about this one because it is over 700 pages of tips and step by step instructions with screen shots that I have painstakingly compiled for you all. If you haven’t seen these books before, these tips are designed you the ones of us (myself included) that need to see how to do something rather than read instructions on how to do it. Included in this compendium are the following tips & tricks for you all and hopefully one or two of these will make you even more of a Rock Star when it comes to Dynamics AX. Cues are great because they give you a snapshot view into your data and also are a good way to gauge how much work you have on your plate. Although they are super easy to create, Dynamics AX is delivered with 130+ pre-configured cues that you can add directly to your role centers making them even easier to configure. There’s no point in re-inventing the wheel.